For a holiday cottage big enough to sleep friends and family, it's well worth having a closer look at White Hopton House in Sarn near New Town. 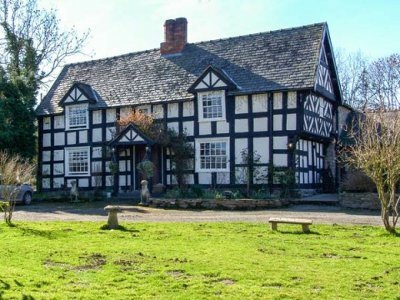 Located near the border of England and Wales, White Hopton House sleeps 12 people. White Hopton House stands in 12 acres of grounds - and shares these grounds with the owner of the property. You also have an outdoor swimming pool to make the most of - you really can't beat starting the day with an early morning swim! And if that's not enough, you can relax in the sauna. There are 6 bedrooms at White Hopton House - made up of 4 double bedrooms and 2 twin bedrooms. A couple of the double bedrooms are also en suite. You have a wood burning stove and oil central heating. A bunch of satellite TVs are provided; games consoles, a CD player and Wi-Fi are all provided too. You get a washing machine, tumble dryer and dish washer at White Hopton House to help with the chores. Outside there's that swimming pool (a photo of which can be seen below); and a patio area with furniture and a bar-be-que. There is plenty of off-road parking too. You can stay at the cottage and make the most of the peace and quiet, or head off and see the area - for those feeling energetic, you can try mountain biking & cycling; or walking. Offa's Dyke - which marks the border with England and Wales - make a good place to take in the views. Bishop’s Castle, Church Stretton, Ludow and the Kerry Rideway all make a good place to spend some time. You can even head to the Welsh coast and the beaches of Cardigan Bay. Holidays at White Hopton House start on a Friday. Should White Hopton House not be to your liking, but you fancy staying in the area around New Town, you might well be interested in the cottages below. All these cottages are within a few miles of White Hopton House.